6. Don't fall into the trap of thinking that creativity descends on you at random. Creative thinking comes most easily when you're writing regularly and frequently, when you're constantly thinking about your project. I found some validation for yesterday's haiku rant in a London Evening Standard article in which the British Haiku Society's president was quoted as saying, "These entries are not up to standard. They are using far too many adjectives and far too many syllables. They are also too jokey." It's no longer just about the pinky! (Cryptic, huh?) Click here to read a fascinating article. Although I'd like to call most the above-mentioned stuff, Fake-Ku, I wouldn't dare suggest that anyone is creating fake poetry, and, I wouldn't want you to think that it isn't enjoyable. It has provided me with quite a few laughs over the years, but I don't consider these poems haiku. Therefore, I'd like to propose that English language haiku in which the 5-7-5 form is not the defining feature of the poem, be called something else. We need to come up with something that separates the two types of work. What shall we call our poems? I don't speak Japanese and so have no suggestions for another Japanese term. If we're talking about English language haiku then shouldn't the word be English? Using "essence of a moment keenly perceived," as a guide, and after consulting my handy-dandy thesaurus, I'd like to suggest quiddity. It's slightly exotic, relatively unknown, and it means, "the essential nature of a thing." A great name for a haiku! Perhaps we should come up with something completely different like Andrew Clements did in his book, Frindle. His character, Nick Allen, a fifth grader, decides to rename a pen. He comes up with frindle and begins using a frindle instead of a pen. (If you don't know it, it's a fun story.) So let's see, what's a good made-up word...sketern? lilnym? I'd also like to pass along this link to the Haiku Foundation's digital library, in case you're not familiar with contemporary English Language haiku. The Poetry Friday Round-Up for this week is being hosted by Irene Latham at Live. Love. Explore! I visited the Currier Museum of Art this afternoon to catch the "Building Books: The Art of David Macaulay" exhibit. It was definitely worth going to, and I urge anyone in the area of Manchester, NH, to make plans to view it before it closes on June 14. If you're around this Sunday, Macaulay himself will be there at 2:00 PM for "ARTalk: The Way David Macaulay Works,"
Meet award-winning author illustrator David Macaulay as he discusses his techniques for explaining complex concepts through illustration. Book signing to follow. Free with museum admission, but reservations required. Space is limited. Make your reservations online or by calling 603.669.6144 x 108. My daughter and I especially enjoyed looking through the book of mostly children's drawings and comments about the exhibit. 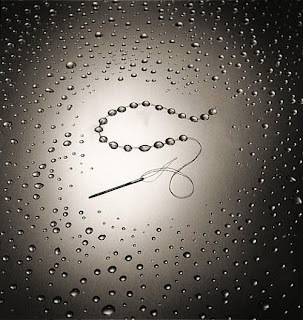 From haha.nu: the lifestyle blogzine comes artfully altered reality by Chema Madoz. Additional photos can be seen at Madoz's website, but don't expect to find too much information on the artist. The page titled The Artist (El Autor), is about the work. Being a writer, I'm intrigued by the story behind the art. Even the entry in Wikipedia is lacking information, but at least it tells us that Chema is male, Spanish, was born in 1958, and that his birth name is Jose Maria Rodriguez Madoz. I offer you this entry into, or perhaps a revisiting of, Madoz's photos as a way to inspire your own work. 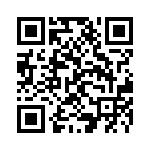 Go to it! YouTube can be the world's biggest time waster, or it can be a pathway to new ideas. You don't have to be suckered into watching every crazy cat video, you know! (It may be physically impossible--I checked and there were "about 37,800" results when I did a "crazy cat" search.) On Poetry Friday you can view short videos of poets reading their work, introductions to writing poetry, and, animated poems. (My favorite animated poem is Billy Collins' "The Country".) The other day I found a trailer for a full-length haiku film! Who knew? Well, now you do! HAIKU: The Art of the Short Poem, a film by Tazuo Yamaguchi, was filmed at 2007 Haiku North America (HNA) conference. 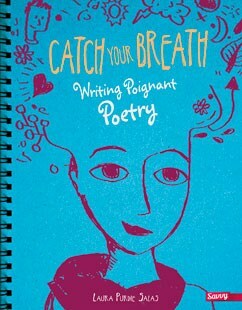 The DVD is packaged with a book containing all the featured haiku, and is available for purchase here. I attended HNA in 2001 when it was held in Boston. I was still too much of a newbie to actively participate, but I did enjoy the haiku immersion experience. 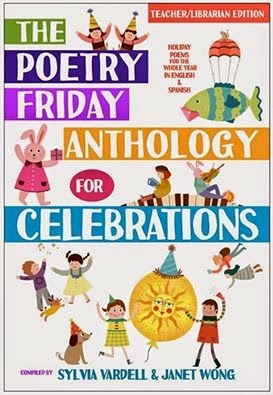 Today, Susan Taylor Brown is hosting the Poetry Friday Round-Up at Susan Writes. for a few days at NH Library Association conference being held in NH's beautiful White Mountains. The conference was fabulous with me learning tons of new things that I'm sure will be a help to me in my research projects. It's going to take me days to wade through the handouts and my notes and then to explore all the websites that were recommended. What fun! Our luncheon speaker today was a young (anyone longer than 50 I consider young) tech-savvy librarian named John Blyberg. Get a load of his title: Assistant Director for Innovation and User Experience. Wow, I'm impressed. I don't know what it means, but it sounds good. Blyberg is the creator of blyberg.net: A Library-Geek Blog. In his speech, he spoke of many things, but one thing he said resonated with me. It is a simple truth, "knowledge is a personal pursuit." I hope you engage in your own personal pursuit each and every day! Apple pie and baseball are held up as the model of Americanism. I won't venture to guess what the Japanese equivalent of apple pie is, but I'm sure that baseball in Japan is as big a national sport as it is in America. Even those who don't follow baseball probably have some baseball related memories stored away. Perhaps it's a sandlot baseball game, or being the last to be picked for the team. Perhaps it's an elementary school memory of listening to a world series game over the loudspeaker, or another audio memory of baseball cards clothespinned to the spokes of a bicycle wheel. City dweller or suburban dweller, I'm willing to bet that you have a few memories of your own. 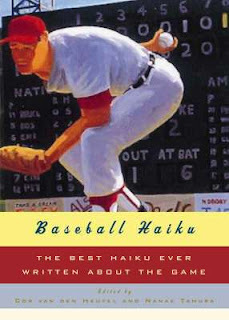 The choice of haiku selected for Baseball Haiku recall memories similar to those mentioned above, and, many, many more. Haiku and baseball were made for each other: While haiku give us moments in which nature is linked to human nature, baseball is played in the midst of the natural elements--on a field under an open sky; and as haiku happen in a timeless now, so does baseball, for there is no clock ticking in a baseball game--the game's not over until the last out. He does a spectacular job of explaining haiku and senryu to those who may not be familiar with the form. A little baseball haiku history is included, too. I highly recommend Baseball Haiku! Here's a Poetry Friday challenge for you: dig up a baseball memory of your own and preserve it in a haiku or senryu. 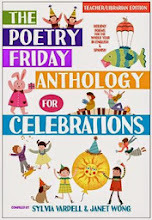 Then, visit Kelly Polark's blog for this week's Poetry Friday Round-Up. I wanted to share a link to BOOK: The Sequel. What is it? It’s a book that asks the world to write the first sentence for a yet-to-be-written sequel to any book ever published. What fun! Take some time to dive into your memory of the books you've read over the years (or faked reading). You can pick any book, not necessarily your favorite book. (Imagine trying to decide upon your favorite book!) Simply find something that you can twist in some delightful new way! You've got two weeks to come up with one sentence and a book title. How tough can that be? I want to share this opinion piece from the British magazine, Standpoint, website. Its premise is that the em-dash has all but replaced the semicolon. I occasionally use a semicolon, but I think many children's writers stay away from it because children have a limited understanding of what a semicolon implies. 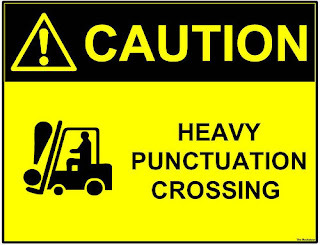 Besides, if we are using semicolons, we are probably writing sentences that are simply too long for our audience. Excessive use of em-dashes is something I will have to be more aware of in the future. Writers of haiku in English often employ em-dashes and ellipses, and less frequently colons and semicolons to indicate a pause. This practice is a result of English not having an equivalent of the kireji or "cutting word." 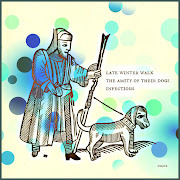 (See the Haiku Society of America's note on its haiku definition here.) I think the use of em-dashes in haiku can also be overdone, I know I've found myself using them a little too often. The lesson here is--everything in moderation--including the use of em-dashes! Poetry Friday--What Is Haiku? And Who Decides on the Definition? As a poet who writes in a variety of forms for both adults and children, I use form, meter, rhyme, "sentence sounds" (the adhesive properties of repeating vowels and consonants within a given line that Frost utilized). Form, in particular provides the pressure. 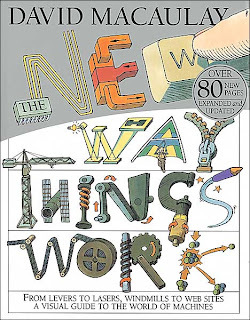 Provides the generative source of ideas and options, forces me to consider and reconsider each word and phrase. Like many folks who practice haiku (indeed, practice is the right word), I opt for the 5/7/5 syllable convention. We all know the original Japanese form does not pertain to 17 syllables broken into three horizontal lines but rather, to 17 units of sound arranged in one vertical line. Furthermore, what sounds like two 'syllables' to an English speaker's ear, may not possess two units of sound. For instance, the Japanese word haibun is often used as an example. It possesses one elongated vowel, as well as an "n" at the end of syllable, which counts as another sound. It's pronounced ha-i-bu-n: four sound counts. In other words, like any kind of translation, the job is to find an equivalency between languages, not making a precise match. And translation is a constantly renewable art because language dates, language exists in time and place. In this book, I applied the idea of haiku to a range of commonly seen birds: THAT is hardly a traditional theme for haiku. Birds, yes, but not a suite of different species. So there began the adaptation. I did attempt to use a seasonal cue for each poem. 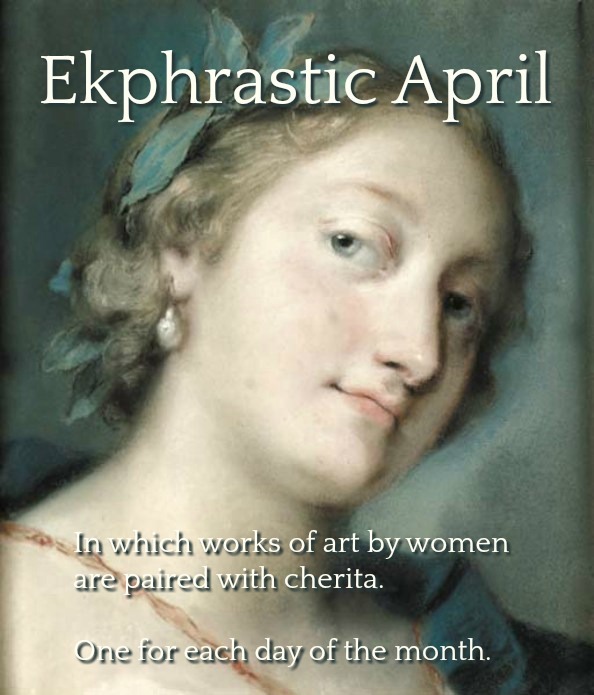 I did use metaphors and similes, partly as a means of enlarging the scope of the observation, partly as a means of layering common phenomenon with nuance or novelty that would allow the reader to dwell on the page. Partly to appeal to younger readers as well. The temptation, which we all have to resist, is to read quickly: I mean, you can zip through a hundred haiku in the time it might take to read a dozen pages of a novel. Haiku, as I appreciate it or use it, needs to possess a centripetal or centrifugal force rather than a forceful gust. It's a churning and a spinning into associations, and not a rolling out of a maxim or a homily. 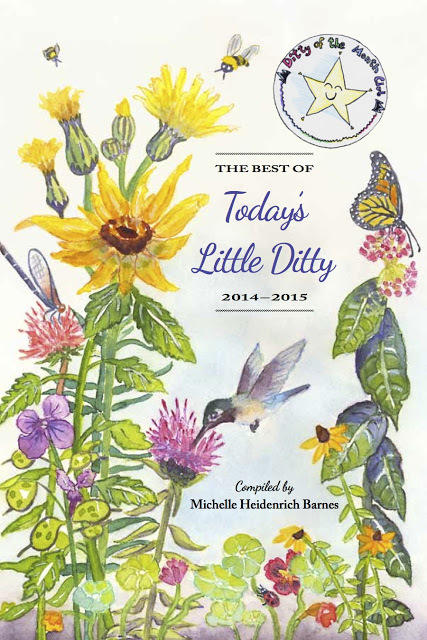 Did I practice haiku in this book in a manner that's vetted by the HSA? Would the very nature of this book adhere to their guidelines? 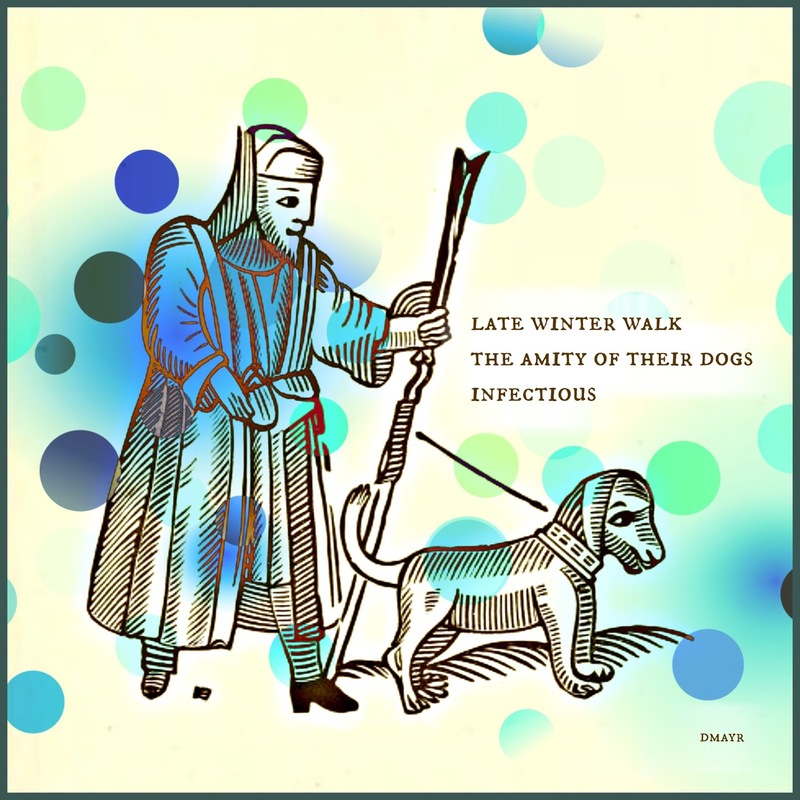 I wouldn't know; while I read volumes of haiku, I find them as varied as I find authors of picture books or composers of sonatas or choreographers of ballet. But, as most artists approach their canvas, camera, dancers, piano, I hoped to exploit the power of tradition and the potential of inspiration or innovation. So, to me, the real questions are: is the book as a whole a success (the mix of field notes, paintings, and poems)? 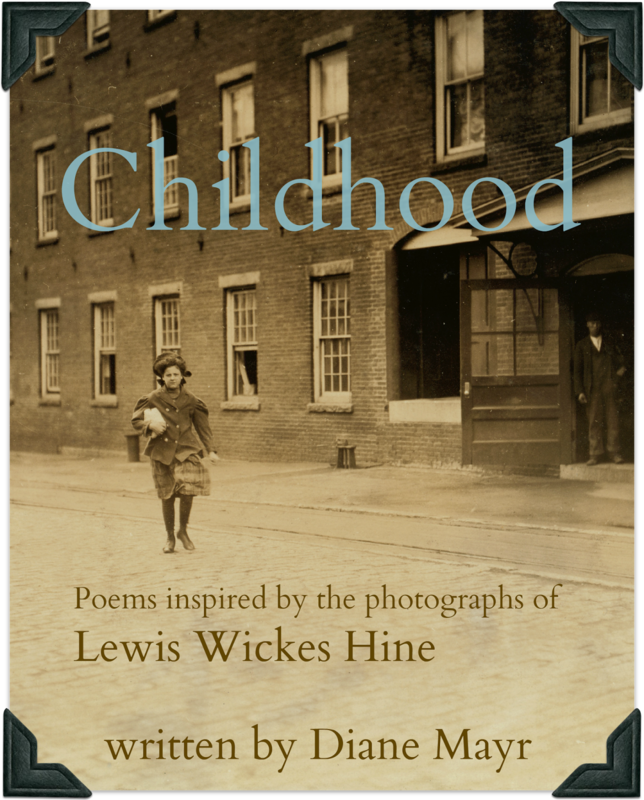 Are the poems enjoyable, insightful, evocative? I don't believe the reader—especially a kid—would ask are these really and truly haiku? We are in complete agreement on your second point: the font that's used for the notes on the page is less than ideal. I tried...I tried...to have it changed. I am bothered by the several times it is asked, "Is this a haiku?" I think the better question is, "Do I want to accept this poem as an example of haiku for myself?" With this way of stating the question, perhaps one can avoid painful discourses. I am totally for discussion, but when anyone assumes the authority to say "what haiku is(or isn't)", I feel the discussion has ended and turned into something quite different. For those who are confused about haiku in English, I'd recommend spending some time with The Haiku Anthology. It doesn't provide instruction--it provides a wide range of examples. 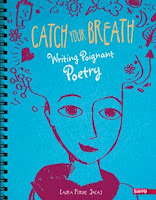 If you'd like instruction, check out Patricia Donegan's Haiku: Asian Arts and Crafts for Creative Kids (Tuttle, 2003), or Jane Reichhold's Writing and Enjoying Haiku (Kodansha, 2003). I congratulate Michael on the success of The Cuckoo's Haiku and welcome all views on haiku! 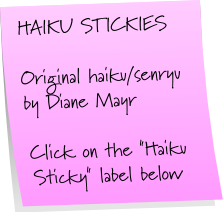 I'd love to have others weigh in on haiku, too, so please leave your comments and take part in a discussion. NOTE: The Haiku Society of America's definition of haiku:"An unrhymed Japanese poem recording the essence of a moment keenly perceived, in which Nature is linked to human nature." The definition was updated in 2004 and now reads, "A haiku is a short poem that uses imagistic language to convey the essence of an experience of nature or the season intuitively linked to the human condition." Unfortunately, I think the old definition is clearer than the new one, which sent me running to a dictionary of literary terms to understand what was meant by imagistic! I got back last night from a short family holiday in Florida. One of the highlights of the trip was taking in a Red Sox game! I can't afford to go to a Sox game in Boston--the tickets are hard to come by and well out of the range of a librarian/children's writer. Surprising, though, it was easy to get a ticket to see them play against the Tampa Bay Rays. My daughter and I went out for dinner on Friday night. We didn't want to go to any of the gazillion chain restaurants that blanket the Orlando area, so we looked for something unexpected. We drove by an Irish/British/Scottish pub. The parking lot was full. There were people sitting at tables outside. We knew there'd be something besides Bud Light on tap, so we turned around and pulled in. Our waitress WAS Irish. The food was fantastic. The beer was, too. The Sox and the Bruins were on the TVs! 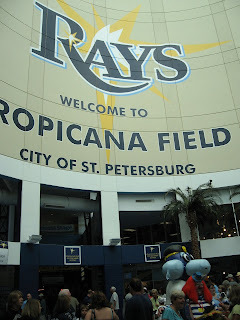 We found out that the Sox had games yet to play in St. Petersburg before leaving the area. We were told that tickets, although harder to get since the Rays won the AL pennant last year, would still be available. When we got back to a computer later that night, we found that indeed, there were tickets, and that St. Petersburg was about 1 1/2 hour's drive from where we were staying. 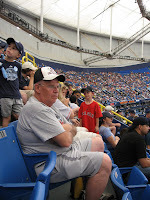 It seemed that it would be possible for us to drive there on Sunday morning, attend at least part of the afternoon game, then drive back to Orlando to make our evening flight to Boston. When we discovered we could purchase a ticket for $16.00, that clinched the deal! 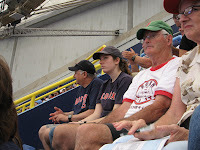 Tropicana Field is no Fenway Park, but, it is larger, and thus can hold more attendees at more reasonable prices. It seems a shame that a New Englander has to travel out of the area to see a Sox game live. How many Boston kids, although living in the shadow of Fenway, will never see a game? 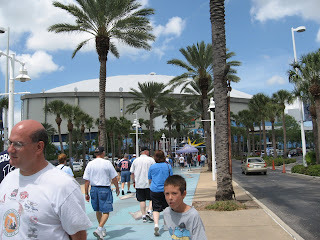 Attending the game at Tropicana Field was reminiscent of a NH Fisher Cats game in that there were lots of families in attendance, there were amusingly corny activities taking place between innings, and parents could treat their kids to a second bag of peanuts because they hadn't spent a fortune to buy tickets. Approaching the domed stadium. That blue beneath everyone's feet is a mosaic pathway of aquatic creatures. Sox fans take the game quite seriously! What do you think? 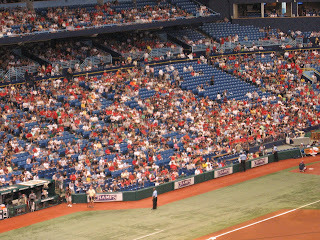 Do the Red Sox fans outnumber the Rays fans? Considering that Sox fans' shirts also come in white, gray, and navy, it looks fairly certain to me! 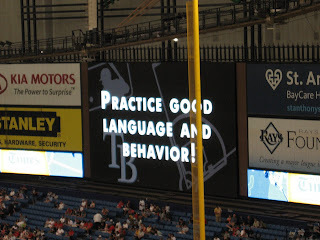 Okay, I admit, I had some trouble obeying this rule--especially after the little blunders at second base!